For June's #HOWISUMMER issue, we asked chefs for their favorite go-to, throw-it-together staples. Here, their easy, delicious and—with the exception of Curtis Stone’s fantastic grilled salad—no-cook recipes that can be assembled in just a few minutes. 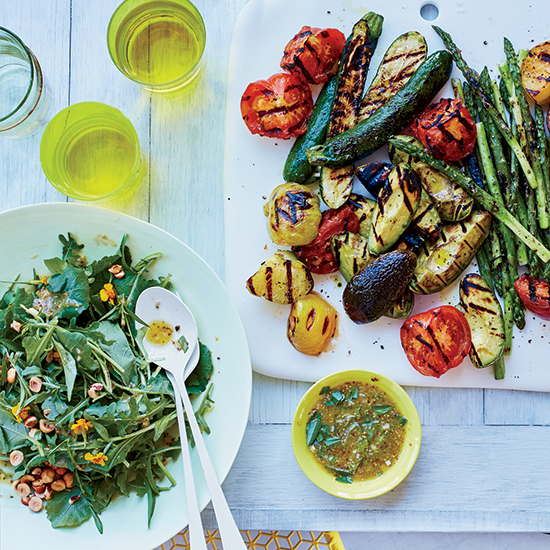 Whether you're looking to make a meal from just-picked greens or you want to create a perfect side for grilled meats, summer is prime salad season. For June's #HOWISUMMER issue, we asked chefs for their favorite go-to, throw-it-together staples. Here, their easy, delicious and—with the exception of Curtis Stone’s fantastic grilled salad—no-cook recipes that can be assembled in just a few minutes. Curtis Stone of Maude in L.A. combines grilled vegetables and summer greens with avocado, hazelnuts and shallot vinaigrette. Find the recipe here. Michael Symon of Cleveland's Lola and co-host of The Chew likes a super-simple Mediterranean-style salad with tomatoes and dill from his garden, plus feta cheese, red wine vinegar and extra-virgin olive oil. For Top Chef judge Gail Simmons, it's all about a chopped salad: corn, tomatoes, cucumbers, radishes, basil and mozzarella or ricotta salata, with lots of olive oil, lemon juice and salt. Camille Becerra of Navy in New York City mixes heirloom tomatoes and strawberries with shallot-sherry vinaigrette for a colorful, super fresh-tasting salad. Timothy Hollingsworth, chef at Barrel & Ashes and the forthcoming Otium at The Broad in Los Angeles, combines watermelon, jicama, feta and olives for a sweet and tangy take on a side salad.